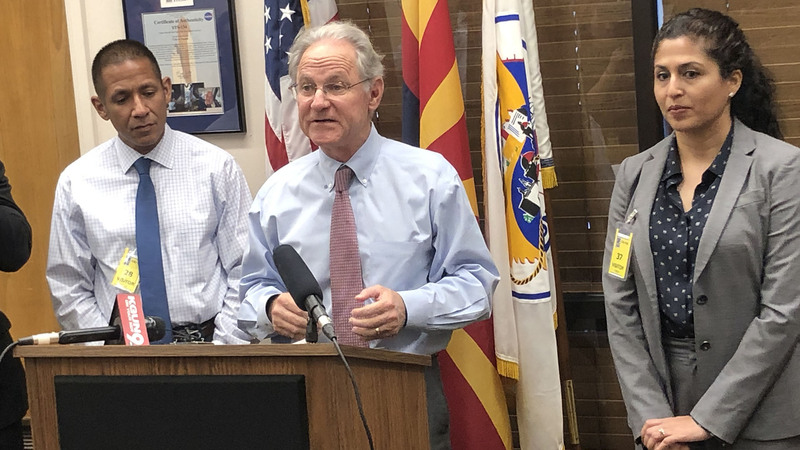 April 15, 2019 / Modified apr 17, 2019 9:25 a.m.
Tucson Mayor Jonathan Rothschild speaks to the media about efforts to re-engage students who leave school, April 12, 2019. A national report says Tucson is making progress in creating relationships with students as an essential part of reducing the dropout rate. Tucson Mayor Jonathan Rothschild presented the findings from the national report evaluating the city’s efforts to re-engage students who leave school before graduation. Tucson Unified School District has an average graduation rate of roughly 86 percent. The Center for Promise, a national research institute based at Boston University, produced the report. The Center is run by America's Promise Alliance, a partnership focused on providing resources for supporting youth initiatives across the country. Dennis Vega is the chief operating officer at the Alliance. "Tucson is a great example of how when you work together you really are more than a village, and we're very excited to be part of shining a light on what's happening here," he says. The report's top finding was that building trustworthy relationships with young people is essential to keeping them engaged with school or bringing them back. Though the city didn’t commission the report, Rothschild was pleased to find it showed Tucson is on the right track. "The thing that stood out to me is the importance of having people who can engage more than just academically but to engage into what they really need in their personal lives," he says. "If you are lost and discouraged or depressed, having someone reach out who cares really can make all the difference." The report also found Tucson is doing a good job connecting young people with community support through partnerships with the United Way, Pearson, Youth on the Rise and Higher Ground, which provides on-the-ground resources in Tucson schools. Mayor Rothschild has made youth engagement a focus of his administration. Despite the progress, young people in Tucson continue to face barriers to school completion and the report also stressed that solutions take time and a willingness to stay with the plan long-term. Rothschild is in his final year in office, but he expects whoever replaces him will continue that commitment. "Remember in the end what this is about" he said. "It's about young people who are likely to remain in this community. And making sure they get an education so that they can be productive members of our community, taxpayers for our community, and not folks who we are going to have to use additional resources on later in life." "I am very proud of our progress and appreciate the support of America's Promise Alliance," said Dr. Gabriel Trujillo, superintendent of Tucson Unified School District. "Over the past five years, our dropout prevention team along with community partners have reconnected over 1,200 students with almost 700 returning to school. This is a great accomplishment, and I feel strongly that each student that we connect with has a better chance of creating a positive, productive future for themselves." The full report can be accessed on the America's Promise Alliance website. Eds. : This story has been updated to name Pearson as one of Tucson's partnerships.